Mobile payments, or m commerce, are expected to reach £2.5 billion by 2015 and with research suggesting that almost half of smartphone shoppers are frustrated with mobile purchasing, now is the time to improve the mobile shopping experience. 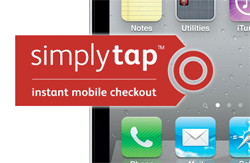 And that’s exactly what our App of the Week, Simply Tap, is looking to achieve. Launched in November, this is an instant checkout app that enables you to quickly and securely purchase products online as well as in-store or even in an ad. It was set up by Charles Dunstone, the man behind Carphone Warehouse, and as more retailers sign up, is expected to begin dominating the way we make payments through our mobile phones. Once you’ve downloaded the app and registered your details, you can begin making instant payments through the retailers that are signed up. The concept it quite simple – when you see a Simply Tap code, whether it’s in-store, in an advert, or even on a website, you enter it into your app, confirm your details, then simply tap to make your payment. Because you’ve registered your card details along with your address, your payment is instant and you don’t have to spend time entering any extra information. I click the checkout button and I’m done, the product will be paid for with my card and shipped to my preferred location. It’s that easy – and this is what makes it a standout app. I think all that is holding it back at the moment is signing up more retailers, however that will come with time as the concept becomes more common and Britain gets more savvy with mobile payment. With Carphone Warehouse looking to move its checkout and payment system exclusively to Simply Tap later this year, I can only imagine that this will be sooner, rather than later.